Well I have been way too busy this week to write up this TR but it was a good weekend with plenty of adventure so I thought I'd do it tonight. * Rhys - just completed paramedic qualification, heading to Tassie next year to work. Done lots of climbing in the Bluies, probably the most experienced and most technically proficient climber. * Me - office worker, know Buffalo pretty well but haven't done any multipitch. Mostly climb trad as I live in Albury - it's about the same distance to Nowra and the Grampians from here. * Larry - Irishman, pretty new to climbing but mad keen. Just got new shoes and really enjoying the difference as the old ones were rubbish. * Andy - chef, also quite new to climbing but pretty fit and a bit of a natural. On the Thursday Rhys and I had agreed we would go up on Saturday morning and come back Sunday evening. Larry could only go for one day so Andy decided to go with him and meet us up there. Saturday morning I slept in a little and was late picking Rhys up. We ended up making a few stops for ice, bread etc. on the way so it was about 10am before we got to the Gorge carpark where we found Larry's car. They'd SMSd to say they were going to do Banana Blase first, so we put some sunscreen on (compulsory at Buffalo) and headed down there. They'd set up an anchor and Andy had just finished toproping the climb. Larry was preparing to abseil. After greetings and a bit of a chat Rhys and I decided to set up a toprope on Pineapple Delight. There were various onlookers around but we ignored them as usual (except when they greeted us) and Rhys quickly dispatched the climb cleanly. I abseiled down (boy was it nice to be up there with a full weekend of climbing to look forward to!) and put my shoes on. If you haven't tried this climb it is a grade 17 but it does have some moves that can be painful or strenuous if you don't apply some technique. Previously I have found it hard for the grade but this time it seemed to flow quite well and I soon found myself at the top. Larry & Andy had turned up after Larry climbed Banana Blase and we decided to swap climbs. By the time we packed up everything and got back to the car it was just before 12 and we eventually decided to have lunch - the reasoning being that if we started climbing again then lunch wouldn't happen until 3 or later. So we headed up to the Leviathan which is about 7 or 8 degrees cooler than anywhere else as it has shade all day (it is a big boulder you can sit under). A bit of hackysak was played. I had some chilli tuna and Rhys gave me some almonds which seemed to make it hotter - must remember that. A little bouldering was done - there are 3 or 4 easy-ish problems we've established apart from the obvious (and hard) flake traverse. Agreement was reached to head to the Horn and try German Beer Drinking Favourites. Larry and I had done the Mouse's Tail the weekend prior and recommended it to Rhys and Andy. So I led GBDF and set up the anchor, and brought Larry up (no-one mentioned the puddle that my precious cordelette was sitting in!). It is quite an enjoyable climb. While Larry was coming up I noticed Andy was actually leading The Mouses Tail, which was exciting since he hasn't led very much before and it's a grade 15 with a committing crux. (In fact I like this climb more than GBDF but it doesn't get a star. Oh well). We scrambled off and I led up Pilsener which is 1 grade harder and shares the start and finish of GBDF but breaks out to the arete for the majority of the climb. I got a little off-route at one stage but recovered and when I topped out Andy had safely finished his climb. Very impressive stuff! Both parties finished their climbs at similar times but since the other guys had only done one climb we decided to hang around and just chat while they did GBDF. This meant we got some reasonable photos, but the day was a bit too dark for anything special (at least from my humble camera). That was pretty much the end of the day, we took some photos from the Horn look out and then mucked around for a bit playing hackysak in the Horn car park. After a brief stint of bouldering on some of the little boulders there, Larry and Andy decided to head home. Rhys and I decided to go and find a campsite. After a bit of driving around we found one, set up camp and cracked a well-earned beer each (it tastes so much better when you deserve it), followed by a gourmet meal. And that was the end of Saturday. To be continued (again) tomorrow as it is getting rather late! I found your TR enjoyable reading gordoste, and I reckon your 2003 piccie of Banana Blase is one of the best photo angles I have seen of that climb. I shall have to learn from you what to do for uploading photos with reasonable definition but still at the correct size, as the ones I have managed to do in the past are pretty ordinary due lack of pixels by comparison. OK well here's the 3rd final part... just got back from seeing Juno which I can highly recommend, it's really funny. ...but somehow he managed to find somewhere else to put it for long enough to get a wire in. "Nice one!" I yelled. No reply -- too focussed. "It's not over yet" I thought. Another move and Rhys got another piece in, this one was obviously pretty bomber as he yelled down "Take! I'm gonna rest here mate!". "OK". I took the weight on the rope. "Why the hell am I here?" he yelled. I treated it as a rhetorical question - my turn to remain silent. I was pretty sure he scared himself and he sure as hell scared me! The decision was made to aid the rest of the pitch (with slings) and as a result it took quite a while, but that didn't matter because the hardest part of the climb had been done! After a few minutes' rest, Rhys started taking in rope. One of the things we didn't take into account is the amount of rope-hauling you do if using double ropes. 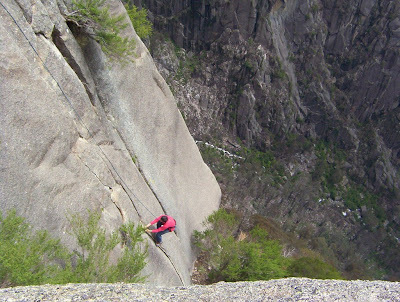 If you climb a 25m pitch, you need to haul at least 25m on each rope. That becomes pretty tiresome and actually consumes a fair bit of time. I seconded, with a pack on containing water and a camera. I used the layback method which is probably the most strenuous and least intelligent way to climb it, and as a result I had to rest a number of times to grab the nut tool as the pieces were all well and truly stuck. At least Rhys could feel confident in his gear placements. I got to the belay and was pretty pumped. I guess the pitch probably took about an hour, maybe slightly more. The next pitch was apparently a 12 and I wanted to make up a bit of time so I grabbed all the gear I could get and charged off. The pitch was really easy, it follows a really positive flake/crack feature but it was very short - unfortunately I didn't realise at the time but I should have combined this pitch with the next one. It would have saved heaps of time. Ah well, next time. Rhys quickly followed that pitch and at the belay we took our shoes off and had a bit of water. I also got rid of my thermal top which was getting a bit toasty since we were sheltered, active and in full sun! Looking down. 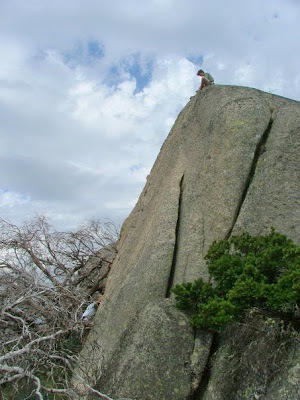 The climb starts in front of the big boulder with the holes eroded on top. Well, we couldn't escape, so the only way was onward. The flake feature runs out at this point so the climb traverses across a holdless slab (protected by a couple of bolts) to a chimney with a massive chockstone in it. From this chockstone you can access a vertical hand-crack which leads to the top. Stepping onto the slab is quite committing, so I climbed up and placed gear as high as I could before climbing back down to start the traverse. You traverse about 4m before being able to clip the first bolt so a fall at this point would be pretty painful! Another bolt follows and pretty soon you're in the safety of the chimney. Unfortunately I didn't think too much before leaving the belay and ran out of gear, so I had to get Rhys to clip a #4 cam to the rope I wasn't using so that I could set up an anchor under the chockstone and bring him across (after pulling through both ropes yet again). A small "pitch" followed as Rhys did a couple of moves to get on top of the chockstone and set up an anchor in the handcrack. Here we got the first bit of shade we'd had since starting so we drank more water and had a bit of a rest. No-one felt like leading but Rhys was happy to aid the last pitch, which he did. I found out later on second that it is much less difficult than it looks - the jamming is very secure. Finally we topped out and high-fives were exchanged... such a relief to finally get there, we both forgot for a couple of minutes about how tired we were and just felt that satisfaction you get from pushing yourself and succeeding at something challenging. While packing up it occurred to me that it had probably taken us quite a while to do the climb. I checked my phone and it was 6.30pm! I think it took us so long for a few reasons - the number of pitches we did, the fact we aided a fair bit (and we haven't done much aid before so it was slow going) and the amount of time we spent hauling ropes up. Anyway, we quickly packed up, rang home to say we'd only just finished and would be home pretty late, and hiked back down to the car. An hour or so later I was sitting at the Ovens pub with a schooner of James Squire and a nice steak in front of me, laughing about how long it took and marvelling at the efforts of those who climb 15+ pitches in a day. Had to split that one up due to the length, it was giving me an error when I tried to post it in one piece. Enjoy! Nice TR Gordoste! really makes me wanna get back to Buffalo, only been there once many moons ago. YAY! i didnt fall and do myself a mischief. great trip report mate. look forward to scooting around a bit more before i head to tassie. a small addition to that trip report is that we managed to get a double hack at the Leviathan. Go team! Noice TR Gordoste. Rhyso, good to see the hack making a comeback!! Hey great TR and photos. Initiation was my first climb at Buffalo (hey it made sense) and I wasglad to knock that first pitch off. Gets a little hard a little too quickly hey? If you need two ropes for abseil approach/descent you need to make the decision in advance whether to climb on doubles or to climb on a single and trail or carry the other. Sounds like you had two single ropes that you then used as doubles - that is heavy. If you are going to climb on doubles you need proper double ropes; the combined weight is still greater than a single but that is offset by reduced drag on complex pitches. Double ropes do take practise though. The first pitch of Initiation has spat off quite a few of us over the years. >and trail or carry the other. just wondering do you climb it as a slab, using the crack to help a little, or do you layback it? Basically fingerlocks and layaways on the first pitch, just gets a bit harder for the last couple of moves. Indecision is the killer at that point. it sure is mate, it sure is. >harder for the last couple of moves. Indecision is the killer at that point. That's the way I did it too. There is a reasonable stance where you can fire in a couple of good bits, then just move confidently and soon enough the flake was curved over and you have better feet. There are 18 messages in this topic.